Discover Mini Dental Implants with Rizkalla Dental in Plymouth, MA! Implant dentistry has created many ways for patients with missing teeth to regain a functional smile. Even patients who already use prosthetic dental appliances may benefit from the added security dental implants provide. For denture wearers who are having trouble adjusting to their false teeth, mini dental implants can supply the stabilization necessary for comfort and complete satisfaction. In Plymouth, Massachusetts, the team at Rizkalla Dental places mini dental implants in order to create additional support for full dentures. Mini dental implants are about half the size of full dental implants, but serve the same function in that they act as a replacement for the root of a tooth. Mini dental implants are typically made out of titanium with a design that allows faster healing and long-lasting results. The top of a mini dental implant is shaped like a metal ball and protrudes from the gum line in order to snap into a housing structure that connects to the full denture. The result is a stable denture that fits comfortably atop the gum line. Receiving mini dental implants is a procedure much less invasive than receiving full-sized dental implants and generally takes only one hour to complete. Patients receiving implants in their lower jaw will have up to four holes created in the bone that help situate the mini dental implants. The implants are stabilized and a denture is measured to determine where the mini dental implants will connect. The denture is then sent to a laboratory where holes are drilled into the designated locations. Once the denture has been modified, it can attach to the implants by snapping into place and resting comfortably on the gums. At Rizkalla Dental, we want to ensure your complete satisfaction with your dentures. 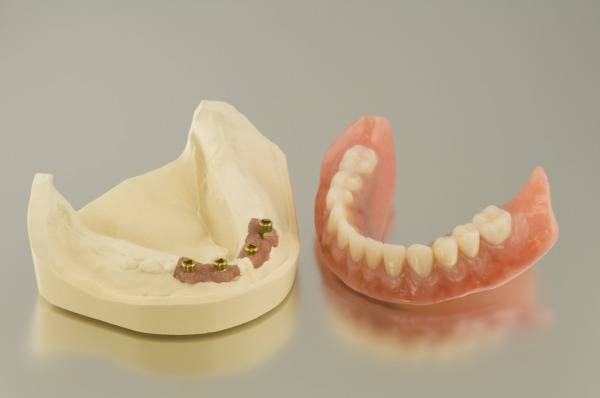 If you currently wear dentures, we will examine your current set and determine whether you qualify for implants. Mini dental implants are the perfect solution for loose-fitting dentures that have proven difficult to manage. Mini dental implants are an efficient and affordable way to restore complete functionality to a false set of teeth. The procedure requires no stitches and patients experience little downtime once the procedure is complete. You shouldn’t have to worry about ill-fitting dentures getting in the way of eating or speaking. With mini dental implants, you will achieve a quality smile that is more secure and functions just like natural teeth. If you would like more information about mini dental implants or to find out whether mini dental implants are right for you, contact Rizkalla Dental in Plymouth today!